Well, it's a rainy day outside, but since I'm inside at work on my lunch break, I can't complain too much. As promised, here are the books I've read since my last book review post. 1. Neil Gaiman's neverwhere Mike Carey, writer; Glenn Fabry, artist; Tanya & Richard Horie, colorists; Todd Klein, letterer. This is a graphic novel based on, you guessed it, Neil Gaimon's neverwhere. I haven't read the book, so I can't do any comparisons. This graphic novel was significantly longer than the two I wrote about last time, which meant that there was more character development, as well as more plot, which was nice. I didn't like the graphics nearly as much, though. And the subject matter was a little bleak. Also, there was another "little psychotic bad man who's always with a huge psychotic bad man doing bad things" couple. Tad William's Otherworld series had a pair, and so did Terry Pratchett's The Truth. Weird. 2. Donnerjack by Roger Zelazny. I read this book because my cousin Kelcie saw the quote "Ginger Rogers did everything Fred Astair did, only backwards and in high heels" and figured out where she'd come across it before - in Donnerjack. I liked this book quite a lot. The only other Zelazny that I've read is his Amber Chronicles - I have a book with all ten volumes, and I've read it a couple times, and like it, too. This seemed more fleshed out than any of the Amber books (not too surprising since it was one of his later books and the Amber ones are older). The story takes place in the future, where there are two realities: Virtu and Verite, the virtual universe and the "real" flesh and blood one. And it turns out they're not as separate as people think they are. It's a nice heavy book - not that it's tedious or slow to read, just that it's full of characters and ideas and places. 3. 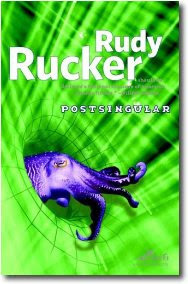 Postsinglular by Rudy Rucker. I got this book out of the library because it had an interesting cover and a cover blurb which proclaimed, "Rudy Rucker should be declared a National Treasure of American Science Fiction." So, I gave it a try. Overall, I wasn't too impressed. The main thing that bothered me was that I found the dialog extremely stilted. It was a interesting story, with lots of "what tech stuff could happen in the future," but I didn't find the characters that engaging (probably because of the aforementioned dialog issue). Reviewers expressed shock and awe at Charles Stross’s imagined future, because it’s just a bit too probable. Even his minor details, such as clothing with RFID tags that can speak to washing machines, are mind-bending. Overall, Halting State is a fast-paced, tightly plotted, and highly intelligent novel. While some of it may read as gibberish to a less in-the-know crowd (it’s helpful to know such gamer slang as "nerfed"), the tech-savvy will rejoice. One reviewer thought the plot became convoluted at the end with a too-neat resolution. But others, like Cory Doctorow in BoingBoing, commented, "This is a book that will change the way you see the way the world works." The book follows three main characters (a forensic accountant, a programmer, and a cop). The one thing that threw me off a little was the fact that it's written in the second person, a very unusual choice and one that took me a while to slip into. This is the second time I've read Halting State and I enjoyed it even more the second time. There were a lot of details I didn't catch the first time through that I could appreciate this time. Well, turns out that the last 3 books I've read were all books that take place in a future where technology has irrevocably changed not only the way we do things, but also the way we think. And I didn't even plan it that way. I'll try to pick something in a different vein for my next book.